Imerovigli village. Should I visit it? Imerovigli village is a quiet place. It has differentiated itself from Fira and Oia, the other two well-known cliff villages, in a couple of ways. Let’s start with a few general information. Imerovigli is built on the highest spot of caldera, 300m above sea level. 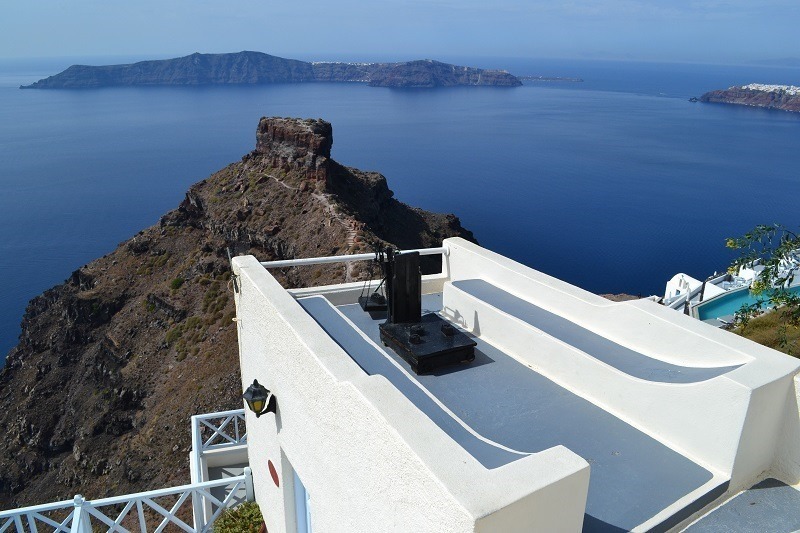 Knowing this, you can imagine the view of Santorini and other islands that it provides. Its location, gave Imerovigli its name, because in the past where the village is now, there was an observation tower. Its purpose was to warn people of Santorini about approaching danger like pirates. In Imerovigli you won’t find tourist shops, taverns and a lot of other things you might think it should have, given its popularity. Instead, there are few cafes and couple of mini market. A complete serenity it’s what defines the environment of Imerovigli. That is why it hosts the most luxurious hotels in Greece, which also are of course, the most expensive. You might wonder why you should visit it. That is because of the architecture and the breathtaking rock that stands between Imerovigli and caldera. Its narrow and colorful alleys, that look like a cut between houses or hotels are impressive, the chapels and small churches hidden among cave rooms and suites are spectacular, and the view, especially from the church built on the west part of Imerovigli is indescribable! On the impressive rock, there are ruins of a Venetian castle, which was abandoned after 1817. On the west side of the rock, you can also visit the picturesque church of Theoskepasti. It looks like a long way to get to the rock, with a lot of stairs but it’s worth your trouble! Just wear proper shoes! Walking along the alleys of Imerovigli can be exhausting. Especially if you like to discover most of the village. But the photos that you will take and the feeling that you are in a very unique place will compensate you! The answer to the question if you should visit Imerovigli, is definitely YES! This is a place that you will talk about, when you return home after visiting Santorini. How Santorini was created; A quick story.